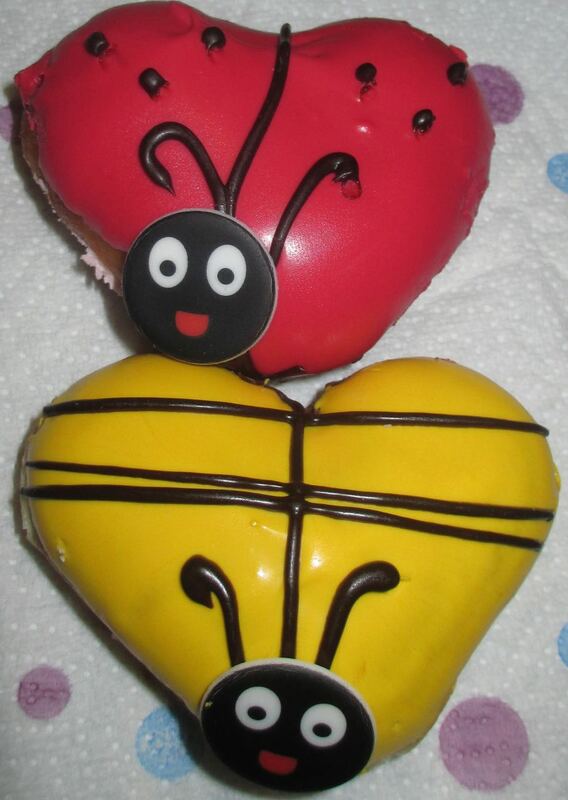 Spectre spotted these new Krispy Kreme Valentines Love Bug and Honey Bee Doughnuts in a branch of Tesco we had stopped at on the way back from a spa break. They were so cute they caught our attention and we ended up buying some (well several because we "needed" to fill the large box). 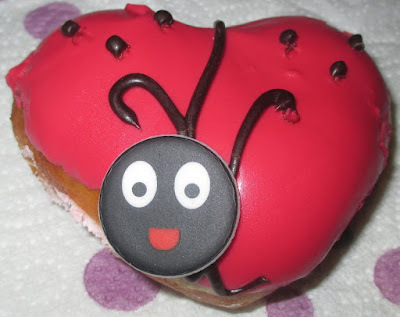 The first one we tried was the cute looking ladybird style doughnut. The doughnut is heart shaped, and decorated in a raspberry icing. My first bite caught both the icing and the cream filling. I discovered that the filling was rather like strawberries and cream, as it was a milky strawberry mousse. It had a good fruity flavour, and the mix of berries and cream worked very well. A totally yummy doughnut. My first bite here only had the soft doughnut sponge and the icing, and I had a lovely hit of vanilla. 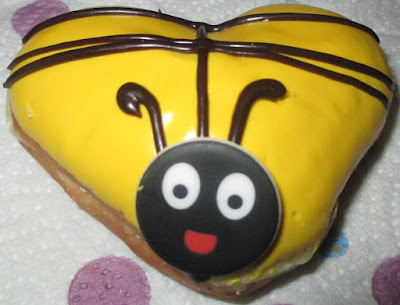 I couldn't help thinking the icing should have been honey flavoured, if you are going to make a bee shape and call it a Honey Bee, you'd think it would be honey flavoured somewhere along the way. The filling was a beautiful rich thick chocolate, which overpowered the vanilla icing a fair bit, but still tasted good. Don't get me wrong it is a fab chocolate and vanilla flavour, and again was a very enjoyable tasty treat.